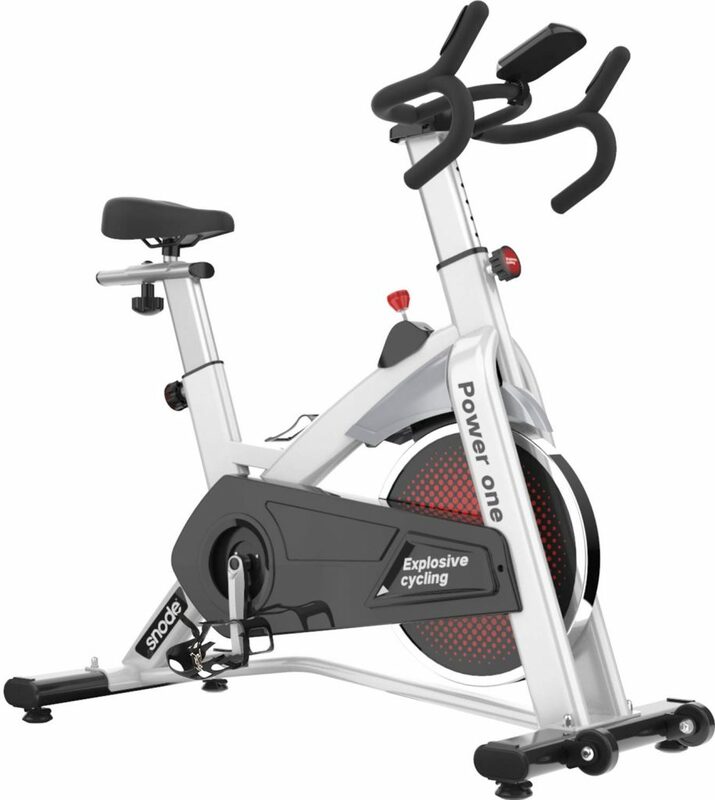 Snode 8729 Power one is a 2019 model hot new release indoor stationary spin bike with a heavy 40 lb. flywheel and smooth belt drive for home use. It has a very sturdy construction with a heavy-duty steel frame that allows high total user weight capacity and a stable cycling experience. 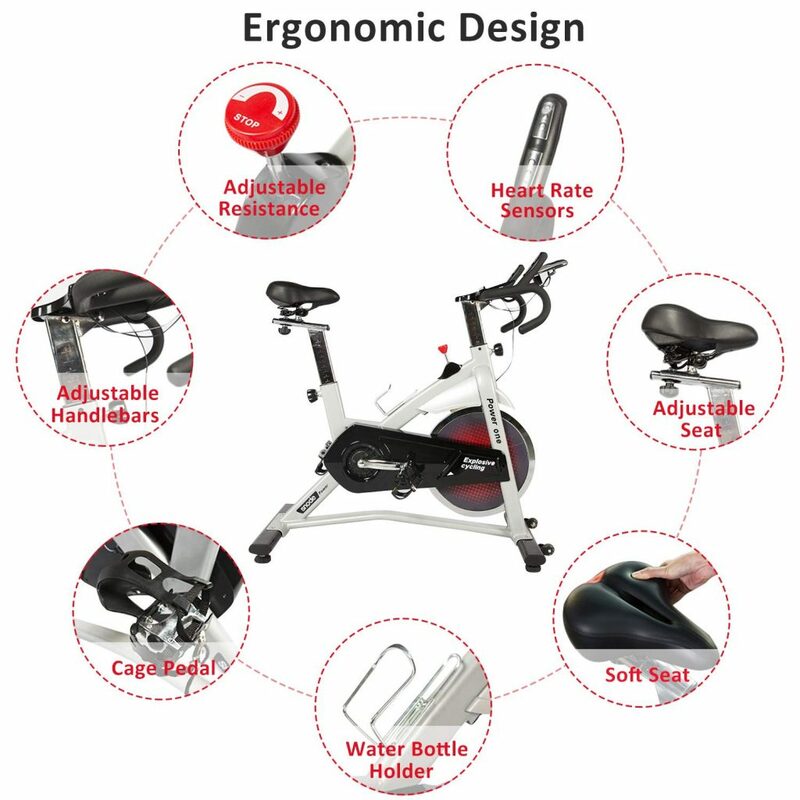 And it comes with a variety of user-friendly features like a modern LCD display with a tablet holder, wool felt brake pad, soft and adjustable seat and handles, cage pedal, aluminum alloy water bottle holder and more. The chromed solid 40 lb. flywheel with a heavier inertial weight offers higher amount of resistance to let you burn more calories and fat in the same amount of time. There is a tension knob in the center to let you adjust the resistance to different levels conveniently by a simple twist. It will make the cycling feel more like a proper real road experience with more intensity at higher resistance. You can also use it as an emergency stop brake when you need to stop immediately. This being a belt driven bike you can enjoy quieter and smoother rides than the chain driven systems. The smart digital real time LCD-backlit workout display panel shows the current speed, calories, distance, time, ODOmeter and pulse rate through the heart rate sensors ergonomically positioned on the multi-grip handlebars. You can hold these handles at different positions to target slightly different body parts and also cycle in sitting, standing or sprinting positions. You can put your tablet or smartphone on the tablet holder below the display panel and listen to music or watch videos to keep you distracted during your session and exercise for longer. The soft and comfy seat can be adjusted four ways, horizontally and vertically and the handles vertically- up and down for the comfort of shorter or taller people. The inseam height range is between 32 and 40 inches. Your feet will stay in place during your session with the anti-slip textured pedals with the adjustable toe cages. With the convenient location of the water bottle holder you don’t have to get off your seat when you need to get some drink. The Snode Power One weighs 90.4 pounds with the measurements of 41 x 21 x 46 inches. The maximum user weight it can carry is specified as 280 pounds. It is best that you keep the distance between the handles and the saddle as long as your forearm. It is not a foldable bike but includes the transport wheels for being rolled around easily in your house. The main advantage of having a heavier flywheels is that the ride will be smoother and you’ll experience more intensity during your session. The Power One comes equipped with a solid wool felt brake pad that decreases the noise. You may contact their customer support team for a replacement when your first brake pad gets worn out. The cushion on the saddle has the breathable sponge covered by the artificial leather and offers decent amount of heat dissipation. You’ll feel comfortable even during your longer workout sessions. It is easy to assemble when you follow the instructions carefully and shouldn’t take long. Snode Power One is quite a good quality bike that comes with user friendly features and offers plenty of user comfort. It is not cheap but we think that it is well worth the price tag.